Grand Central Publishing, 9781538711415, 256pp. The former first daughters share intimate stories and reflections from the Texas countryside to the storied halls of the White House and beyond. Born into a political dynasty, Jenna and Barbara Bush grew up in the public eye. As small children, they watched their grandfather become president; just twelve years later they stood by their father's side when he took the same oath. They spent their college years watched over by Secret Service agents and became fodder for the tabloids, with teenage mistakes making national headlines. But the tabloids didn't tell the whole story. 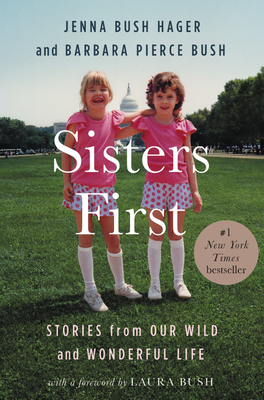 In SISTERS FIRST, Jenna and Barbara take readers on a revealing, thoughtful, and deeply personal tour behind the scenes of their lives, as they share stories about their family, their unexpected adventures, their loves and losses, and the sisterly bond that means everything to them. Jenna Bush Hager is a correspondent on NBC's Today Show and an editor-at-large for Southern Living magazine. She is the author of the New York Times bestseller Ana's Story: A Journey of Hope, written after she served as an intern with UNICEF in Latin America. She also co-authored the children's books Our Great Big Backyard and Read All About It! with her mother. She lives with her husband and two daughters in New York. Barbara Pierce Bush is the CEO and co-founder of Global Health Corps, an organization that mobilizes a global community of young leaders to build the movement for health equity. GHC has mobilized almost one thousand young leaders who believe health is a human right and who take an innovative approach to solving some of the world's biggest global health challenges. Previously, Barbara worked at the Smithsonian's Cooper-Hewitt, National Design Museum, and Red Cross Children's Hospital in South Africa, and interned with UNICEF in Botswana.